Ralegan Siddhi (Maharashtra), Nov 20 : Veteran social activist Anna Hazare on Tuesday said that Aam Aadmi Party (AAP) leader Arvind Kejriwal was not his enemy. He further revealed that he wrote a letter to Kejriwal to clarify whether his name was being misused by the AAP during its election campaigns. 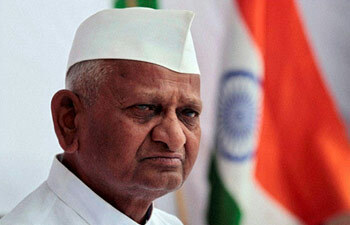 "He (Kejriwal) said that Anna Hazare's Jan Lokpal Bill would be passed on 29th December. But using my name is wrong," he said. Hazare also said that he is been made an accused in a court case that deals with SIM cards issued in his name, which were reportedly used during his Jan Lokpal Movement to collect funds. "I was not aware that SIM cards are being issued. I was told that SIM cards were issued in my name during the India Against Corruption (IAC) movement, the sale of which led to collection of funds. When I have nothing to do with those SIM cards, then why I have been made an accused in the case. That is why I suspect my name is being misused," he added. Earlier in the day, Kejriwal said he has tried several times to speak to the man he calls his "guru," Anna Hazare, but "intermediaries... people in the middle" don't allow him to.